On Wednesday, May 17, 2017, many of America’s leading information, software, and publishing businesses, as well as multiple national trade associations, unveiled the Corporate Committee for Library Investment to advocate for federal library funding. As Congress turns to funding the government beyond next September, CCLI launches against the backdrop of Administration proposals to eliminate most federal library funding and the agency that distributes those funds to every state. Members of CCLI are united by the common belief that America’s libraries are business-building, job-creating, workforce-preparing engines of the U.S. economy in every corner of the country. The group was formed to tell that story to Congress and other federal policy makers who control library funding and to encourage every American business to do the same. On May 17 CCLI delivered a letter, which remains open to signature by any business of any size, to all members of the United States Senate. (Eight companies made a similar delivery in their own names on May 11.) The letter expressly asks senators to sign two letters to their colleagues on the Appropriations Committee calling for $186.6 million in FY 2018 funding for programs under the Library Services and Technology Act (LSTA) and $27 million for the Innovative Approaches to Literacy program (IAL). LSTA funding goes primarily to a population-based matching grant program that puts states in charge of how federal funds are spent. IAL allows school libraries and non-profit groups to buy books and educational materials for the nation’s neediest children. Libraries are fundamental to our democracy. They are essential to our culture and our civilization. Without sufficient resources, our libraries will not be able to undertake their mission, and we will all suffer—we will not be able to sustain an educated populace. Supporting our libraries must be seen as a basic obligation of our government so that all of us, regardless of our economic position, have equal access to knowledge. – said Michael Ross, Senior Vice President, Britannica Digital Learning. 2. Assure that any infrastructure investments authorized by Congress both include library facilities and leverage the nation’s 120,000 libraries to make high-speed broadband service available in every corner of America, especially in rural and other underserved communities. CCLI was co-conceived by Gale, a Cengage company, and the American Library Association, which will provide logistical support for the group. Founding members include Baker & Taylor, bibliotheca, Candlewick Press, Corporate Graphics International, EBSCO Information Services, Encyclopædia Britannica, Findaway, Follett, Gale/Cengage, Information Today, Jamex, Mackin, Macmillan, ­­OverDrive, Peachtree Publishers, Pearson, Penguin Random House, Prendismo, ProQuest, Public Information Kiosk, The RoadRunner Press, Rosen Publishing, SirsiDynix, the American Booksellers Association, and the Software and Information Industry Association. CCLI’s membership is continuously updated online at fundlibraries.com. 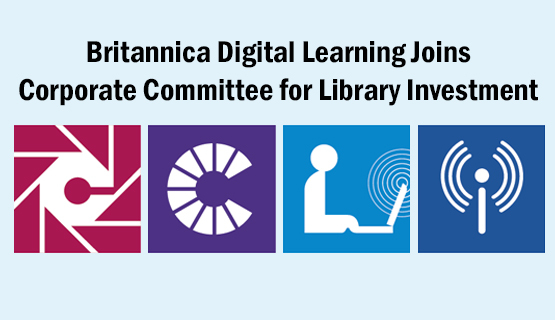 The Corporate Committee for Library Investment (CCLI) is a group of companies and national trade associa­tions working to educate Congress and other federal policy makers about the extraordinary value of federal investment in America’s libraries. fundlibraries.com. Britannica Digital Learning (BDL) provides reliable, high-quality solutions to strengthen student achievement and educators’ ability to teach to best practice. BDL experts produce curriculum-aligned resources for all ages from elementary school to college that make creative and purposeful use of technologies widely used in schools today. Products include: LaunchPacks: Science, LaunchPacks: Social Studies, Britannica School, Britannica Academic, Original Sources, and ImageQuest. BDL is a division of Encyclopædia Britannica, Inc., with headquarters in Chicago. Posted by Corporate Committee for Library Investment on May 17, 2017. For all press inquiries, please contact: bdlpress@eb.com.